Pioneers in the industry, we offer pineapple corer and sizer, pineapple juice extractor machine, slicer machine and pomegranate juice extractor from India. Capacity 12-15 Pineapples per min. · Machine finds its advantage for carrying out coring of pineapple fruit along with required coring &sizing of pineapple fruits. · Pineapple is placed on holding structure manually. · Mechanical Cam mechanism is used for carrying out operation of both coring and sizing. · There is separate arrangement for both waste and finished fruit produced during working operation. · Optimum quantity of waste is produced during working operation. · Hollow tube arrangement is used for carrying out coring operation. · Initially coring of fruit takes placed and is followed by required sizing of fruits. Capacity: 12-15 pineapples per minute. · Stainless steel material SS 304/ 316. · Maintenance and cleaning of machine is to carry out. · Usage of machine is in industrial, domestic and commercial purposes. · Adjustable coring and sizing size according to requirement. Capacity 500 to 1000,2000,3000 kg/hr. This machine finds its application in extraction of juice from pineapple fruits. 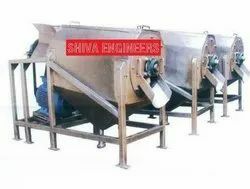 · Continuous feeding/extraction of product ensuresby using feed conveyor. · Suitable for extraction of juices from fruits like pineapple, orange, apple, ginger, amla etc. Voltage: 230/415 V, 50/60 Hz. Capacity:500 to 1000 ,2000,3000 kg/hr. Dimension: 1000 x 700 x 1830 mm (LxWxH). · Stainless material of grade SS 304/ 316. · Applicable for fruits such as orange,pineapple, ginger, etc. · Highly efficient in nature. · Adjustable fruit according to requirement. Size 3000 x 865 mm x 1550 mm. · Machine finds its application in slicing of products into required thickness. · This machine suitable for products such as all types fruits & vegetables etc. · Products are manually placed on belt that is attached to cutting tool which carries out slicing operation. · Being automatic in nature it consistsof sensors for safety and efficient working of the machine. 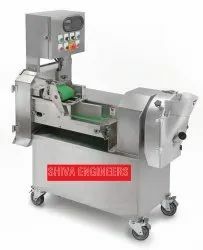 · Specially designed cutter is used for slicing of products. · Mechanical drives are used for both motor and belt system. · Belt speed and cutter wheel is designed in accordance to get uniform and same thickness slice of product. · Thickness of sliced product can be in wide range from requirement of products. · Different slice cuts can be obtained by replacing cutting wheel according to requirement. · There is outlet for sliced product which is then collected at storage vessel placed at outlet of slicer machine. · No any moving or rotating part of machine comes in contact with operator during working operation of machine. · This machine is applicable for products such as carrots, potatoes, etc. · Maintenance and cleaning function of machine is easy to carry out. · Slicing thickness of product can be varied according to customer requirement. Voltage: 230/415 V ,50/60 Hz. · Stainless steel of grade SS 304/ 316. · Processing capacity of machine is high. · Special designed slicing wheel. · Suitable for products such as all types fruits & vegetables etc. · Adjustable belt and slicing wheel speed. · Emergency stop button under faulty operation.